I was lucky enough to get a “lamb” for Christmas. It is perfect for curling up in a chair and reading in the winter. Beautifully made and sturdy. Would also be great for anyone who goes to football games. This is a wonderful, creative idea! The blanket far exceeded my expectations. Last Christmas I received a “sheep” from my daughter. It has been fantastic! As a child we had sheep and had the wool made into blankets. Sadly all but one are gone. 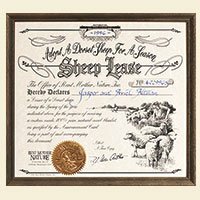 Getting my “sheep” was the most perferct gift! I loved getting the updates and the blanket is just beautiful! My thanks to you all from the sheep on through the weavers and all who made it possible. Heres to many warm nights! It’s such a mystery why wedding gifts of livestock ever went out of vogue. Very high quality blanket. I like the size of it. I can see using it for years to come. I also loved the newsletters. Hello, we rented a sheep for very dear friends for Christmas and the blanket arrived yesterday. It is gorgeous and has such sentimental value as my husband, Tom, who discovered you, passed away in June. We all had forgotten about this gift and then it arrived. All of us were touched and so thrilled so I wanted to thank you.